Resource Description Framework (RDF) is a general description technology that can be applied to many application domains. Redland is a software library for RDF which implements a flexible framework that complements this power and provides a high-level interface allowing instances of the RDF model to be stored, queried and manipulated. Redland implements the model concepts using an object-based API and provides several of the classes as modules which can be added, removed or replaced to provide different functionality or application-specific optimisations. The framework also provides a core technology for developing new RDF applications that can experiment with implementation techniques, APIs and representation issues. RDF is a general purpose technology that enables the description of resources on the web using URIs for identifying the resources and URIs for the properties that describe the resources. This design means that there is a large range of applications that can use this generality customised for their target domain. 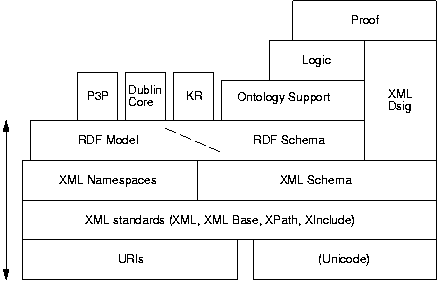 RDF and RDF Schemas are designed to work across domains and provide common facilities for describing resources, collecting them in containers and maintaining type and class relationships. The RDF specifications make very few restrictions on the kind of information that can be recorded in order to provide an open description technology for the web and thus the software systems that implement them need to be very flexible. As of early 2000, the major deployed applications of RDF were mostly either embedded inside products such as the Mozilla web browser or as separate systems such as SiRPAC as used in the GINF project and elsewhere. Mozilla uses RDF extensively for representing the internal platform data sources, as well as for configuring the user interface. This code in C++ is quite integral to Mozilla and difficult to separate out in order to reuse, since it is optimised for Mozilla's object and class systems. SiRPAC is a Java application that grew from a parser into a more general application from the GINF project. SiRPAC is easy to use in Java applications but that is not the language used by most web applications and hence not suitable for all uses. There were other well deployed applications and services that used RDF internally such as rpm2html / rpmfind (and related tools) used extensively for indexing Linux RPMs, and the UK Mirror Service which uses RDF for mirror and content description however these mostly use the tree-based XML DOM interface in custom ways for their application rather than present any general RDF interface. This also means that they didn't use a full expression of the RDF model or syntax and more specifically didn't have full RDF parsers. Conversely, on systems where it is efficient to represent many models and sub-models in the same storage system, the results of queries might be best represented as models in the same storage. For example if a relational database is made visible as an RDF model, and a query is performed over it, it is not necessary to create a new stream of statements for the resulting model since the relational database can efficiently express this as a view on the queried model. This gives the requirement for support of model to model operations without the need for serialising them. Redland implements the RDF model however this might mean different things to applications, which understand more or less of the detail of the model. Some applications require only certain parts of the functionality and want to do the rest themselves while others want to use Redland as a closed system. These issues are addressed partially by modules - see Section 4.3. In general though, Redland is part of a layered system with the application at the higher layers, in which Redland might provide multiple lower layers layers that the application could interface to. It might be useful to provide, for example, a schema-checking model rather than one with no validation. This is performed by layering inside Redland where the schema-checking model uses a lower layer model implementation in order to provide this. Other examples of higher layers that could be provided include models providing associative or bi-directional properties for application specific purposes, checking trust models, digital signatures or with transaction support. Redland was designed to cover approximately the lower four layers of the building blocks of the diagram shown in Figure 2, based on one by Berners-Lee. Figure 2: Redland provides RDF building blocks. The target languages for using Redland were C for use in compiled applications and languages used in many web applications include at least Perl and Python. This meant that the design had to be appropriate for object-based (Python), non object-based languages (C) and ones that can do both (Perl). The object model is a clean way to specify and implement the design, especially with the requirement for modules (see below) and could be called from non object-based languages if done carefully. Note that full object-orientation with inheritance is not proposed here since that is very hard to express in languages like C but an object-based API using objects, methods and polymorphism. In languages like Java, there is a clean interface / implementation separation but using C this had to be emulated by conventions. A Redland class is defined as a public C typedef struct representing the class and its public interface (constructor etc., methods) defined in a header file along with any public or private types, enumerations or constants. The actual class implementation definition (C struct that the typedef refers to) and internal definitions are not exposed to applications and are only available internally when Redland is compiled. The implementation of the class is defined in a C source file and can include private static functions either for internal implementations or to satisfy part of a factory API. Classes may need to be initialised at load time by what are generally called static or class initialiser code. Redland classes may have a class initialiser / termination pair of functions which must be called before any object in the class is created, and after the last object has been freed. This is needed for many classes but especially those that implement modules which need to be registered at load time , so that they are ready to use when the application code starts and can be de-registered when the application terminates. The requirements, design and language having been chosen, the classes listed in Table 1 were defined for Redland covering the required concepts and the support facilities needed. These were strongly influenced by the SiRPAC Java interface, although flattened to reduce the number of classes and extended for the classes that are provided internally by Java such as URI. At the time of writing (November 2000) the Query, WWW and Serialiser classes are not implemented. The classes are used and associated with each other as shown in Figure 1. The support classes are used throughout the rest of the classes as needed. The Stream classes are used whenever a sequence of statements is accepted or generated by the Model, Storage or Parser classes. 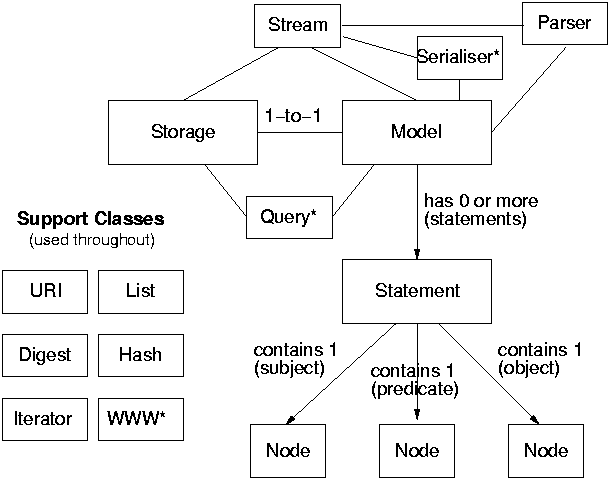 The Model class uses Stream for performing the serialising/de-serialising the Model and returns lists of statements from queries. The Parser class only uses it to provide a sequence of statements as the result of a parse. The Query class is an adaptor class that provides support for particular query syntaxes for Storages. It takes a query as a literal string or as a Model along with a URI to identity the query language. This URI allows the query class to determine if either there is an adaptor class for the language or the storage natively knows it. In the former case, when the storage module does not understand the syntax, the adaptor class rewrites it into a standard query for matching Statements and submits it to the Storage. In the latter case, the query, which need not be written in a statement-centric way, can be directly handled by the Storage. This makes the query process a lot more efficient since the query does not need to be rewritten, several layers of system are skipped, and the results do not need to be rewritten as Statements but can be delivered in a Model. This is possbile since the application and the storage module both understand this special optimisation, represented by the URI. For example, the query could be in an SQL-like syntax such as in  and a relational back-end could handle it very easily without the need to rewrite the syntax into a statement-centric format and thus loose the chance for query optimisation. At the time of writing (November 2000) the Query class is not implemented and only the statement and node-centric queries can be performed. Data flows inside Redland mostly from arguments passed via method calls into the implementing classes and possibly onwards to factories and modules. However, when Redland is connecting objects that are more naturally both working in parallel - such as a parser and a consumer of the statements generated, some other abstractions are needed. Stream and Iterator are used to provide this transfer of data and flow of control for sequences of Statements and Nodes respectively. These classes are reader driven or pulled, since Redland is intended to be used as a library inside an application which will generally be calling Redland to read data rather than pushing data for Redland to process. Redland does not do much processing in one go (apart from parsing) so the pull model is quite natural to use in this way. The Storage class implements managing the storage modules via a factory and also handles optional parts of the storage module API by converting between internal interfaces. From the application point of view, this is never visible although some operations on the Model may be observed to be slower. For example a storage module may implement only the required statement query methods and not the node based query methods in which case Storage will translate between these. In future it may be that application-specific indexes will be added to the hashes for optimising queries or properties that are used a lot. The rdf:type property is one that can be refered to often in applications that ask a lot of schema or RDF typing queries and could be worth optimising for. It could either be done at the storage level or higher up where the type system calls might be intercepted by the model and handled in a different way more appropriate for type hierarchies and detecting loops. This is an example of where the flexibility of the application framework can provide different ways to handle application requirements, without making changes to any application interface. Statements contain three Node objects representing the different parts of the RDF statement and these Nodes have two main types - Resources which have URIs and Literals. In Redland, literals include the string content, the xml:lang and xml:space properties and whether the content is XML content (as declared by the RDF parseType="literal" attribute). RDF statements are RDF resources in the RDF model and in Redland Statements can be used wherever a resource Node can be used. The RDF Model and Syntax Specification defines a syntax for RDF in XML and this needs to be parsed in order to create or add content to models. The Parser class provides access to parsers for this syntax. When development on Redland was begun there were parsers in C, Java, Prolog and other languages but it was not clear how they compared. Modules were written to wrap the Java parser and call the C one plus allow room for more parsers to be added later if necessary. The interface that these external parsers offer is usually a triple of subject, predicate and object with a heuristic having to be used to guess(!) the type of the object - literal or string - in some cases. This has improved since with the addition of a newer C parser called Repat by Jason Diamond which has a better interface. These modules abstract URIs and provide ways to resolve them via HTTP or other requests. These requests are handled by the WWW module that provides a simple interface and a way to return the results. This module is one that is likely to be replaced when Redland is embedded inside an existing web application since it will already have probably better functionality to do this. It is also would be a big problem if Redland blocked an entire application while it waited for I/O from the web. Redland also includes some infrastructural support such as a debugging memory allocation tracker that can be removed from application code and linked with the application's own memory management routines; error and warniing handlers that can be customised by the application; functions for manipulating temporary files and simple parsers for configuration strings used as parameters for some constructor and class initialisation calls. The latter could have used a Hash object but that might be impossible when configuring Redland before the Hash class has been initialised. Redland is still under development and less than 6 months old (November 2000) however the majority of the core work has been implemented and it has been tested extensively over that period. It has now reached the stage of being stable, reliable and has had several public beta releases. Two applications have been written by the author to demonstrate the code in use on the web. Redland was used via the Perl language interface to provide a web accessible demonstration of using Redland to work with the RDF model, allowing users to submit RDF content to a persistent store, make queries, follow the results and try different parsers that Redland supported - 4 at present. These parsers showed differences in what RDF/XML they handle which was useful feedback into issues of the syntax and parsing. RSS is RDF Site Summary and is a lightweight metadata format that allows content to be simply described primarily for syndication, aggregration and other purposes such as building portals. The RSS 1.0 specification takes an older version of the format and re-introduces it as an RDF application (in earlier versions it was RDF). 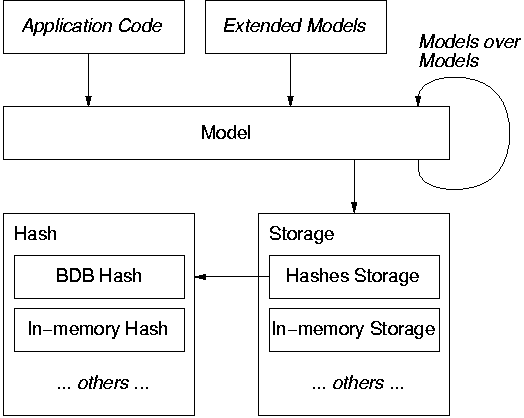 The Redland demonstration uses the RDF model as the RSS model and defines some application specific methods that the RSS model concepts may have. It was a simple and quick job to add a wrapper Perl class that read the RSS content (in RDF/XML format) into a model and provide convienience interfaces for the RSS concepts. The resulting model was then rendered in a simple HTML output format. The RDF open directory test processed 100Mb of RDF data and consistently used 0.3Mb while running and after that returned all of that to the system with no memory loss. This was due to the extreme care taken while writing Redland to make sure that no resources were lost. This ensures it can run in long-running processes such as web services or daemons and be a good neighbour. Redland runs in a small amount of memory because during configuration it dynamically links to the maximum it can with existing system modules that provide digests, hashes (BDB), parsers (such as W3C libwww) so that the total memory (code and data) used by the Redland is minimised. The RSS and RDF web demonstrations show that Redland provides a high-level interface to RDF that can allows the easy creation of RDF web services. These could easily be rewritten to provide some webby RPC-like services such as XML-RPC or SOAP. The compile and install out-of-the-box provided by the automake and autoconf tool configuration makes building and installing Redland a three line job for most systems and this has been confirmed on four major Unix architectures with different word compilers, word lengths and endianness. This shows that Redland is very portable between Unixes. The development of Redland continues to complete and extend the functionality described here plus new developments on a Java interface, some convienence methods for handling RDF containers, and experimentaton with extracting RDF from image formats. The author has also been writing an RDF XML-syntax parser to work better with Redland and participating with other RDF API authors to discuss compatibility issues. Redland implements a powerful modular, object-based library for manipulating the RDF Model and parts - statements, resources and literals. It provides consitent APIs in the C, Python and Perl languages. Redland contains modules for multiple parsers for reading RDF/XML and other syntaxes, storage for the models in memory and persistently and flexibility to extend or modify it using layering, modules and/or factories. Redland is free software / open source software and available at http://www.redland.opensource.ac.uk/ along with links to the demonstrations. Thanks to Dan Brickley for encouraging me to write this, Nicky Ferguson for letting me and the other RDF-ers at ILRT, University of Bristol and HP Labs, Bristol. David Beckett is a Technical Researcher working at the Institute for Learning and Research Technology, University of Bristol since June 2000 and has been researching resource discovery on the Internet with metadata such as IAFA Templates, Dublin Core and RDF since 1993.